It’s not the obstacles we face, but how we handle them that count the most. How do we react or respond to them? How we answer that question reveals how Christ-like we have become. It will be revealed in our response to difficulties. Choose to turn adversity into advantage over the enemy through an open door, difficulties into doors of opportunities, crisis into circumstances for winning souls through meeting needs or confronting problems in a way that reveals the love of Jesus. We don’t attack people – we attack problems. Keep God’s perspective in all of life. We are not victims – we are victors. Choose to turn suffering into service and be a world changer. Tell the world about Jesus! Paul’s difficulties became doors by which the Gospel made steady advancement. How about you? How about in your life? Do you attack or attract people to Jesus? Do you attack people or turn and align them to the Word of God through loving them? Do you rise above the problem and know that you are seated in heavenly places with Christ Jesus, or do you stoop to the level of the enemy and engage in a war of words? Do you respond or react? Choose your words wisely…and make sure to respond as Jesus would…by depending on the Holy Spirit of God. Tell the world about Jesus by the way you live….respond wisely. God loves you with an everlasting love…and He gave His Son for you and me…. When we understand the high price Jesus paid, we see every person as highly valuable! God wants us to love people back to life! GOD’S PRICELESS TREASURE (How To Overcome Challenges, Be Transformed And Know Your Purpose)…published 2011 Creation House Press/Charisma …… Learn how to move from drama to destiny, pain to purpose, a mess to a message, from trials to triumph through turning to Jesus Christ. 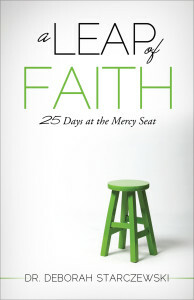 A LEAP OF FAITH (25 Days At The Mercy Seat)…the full account of life and death situations, with the account of how the Holy Spirit led us through 25 days at Mercy Hospital. God raised my husband from death, healed him from two strokes, and walked with us through two open-heart surgeries. This book will give you increased faith to believe God for anything. THE MIDNIGHT HOUR (Will America Turn Back To God?) …a must read for every pastor and leader, a great family devotional and gift for friends, family and associates. The above mentioned books are available at Amazon, Barnes & Noble, www.starministriesinc.com and other distributors.